Background: Laminoplasty is an established technique for the treatment of cervical stenosis. However, the usage of plates to maintain patency of the laminoplasty door has not been well reported. This study plans to compare the clinical outcomes of laminoplasty with the usage of Sofamor-Danek laminoplasty plates versus techniques without plate usage. 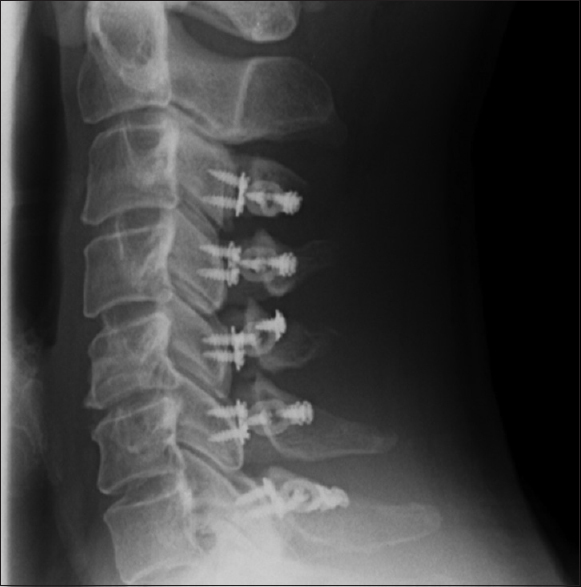 Materials and Methods: This study conducted a 2-year medical record review of all patients with multilevel cervical myelopathy who were treated with laminoplasty at UCLA or Cedars-Sinai medical center. Of 46 patients 18 had sufficient documentation to assess clinical outcome, 11 of which had placement of laminoplasty plates. Clinical outcomes were assessed using Odom's scoring criteria. Results: Blood loss and hospital stay are decreased with plate usage during laminoplasty. Average Estimated Blood Loss (EBL) was 160 cc with plate and 380 cc without. Hospital stay was 4.8 days with plate and 5.6 days without. There were no complications during any of the laminoplasty procedures regardless of instrumentation. All patients demonstrated improvement in symptoms after laminoplasty, with 73% of patients in the plate cohort having Odom Scores of “Excellent” versus 44% in the nonplate group. All patients, regardless of technique, showed improvement in symptoms. Conclusions: Laminoplasty with plate utilization is an effective treatment for cervical myelopathy. The similarity in outcomes and complications between these two similar cohorts suggests plate usage in laminoplasty is an attractive alternative to other methods. We hope that future efforts will continue to demonstrate the effectiveness and perhaps superiority of plate utilization in laminoplasty. Cervical laminoplasty is a technique for alleviating cervical myelopathy by surgical decompression of the cord. The technique was described in 1983 and since then has had proven success for alleviating symptoms.,,,, Various methods have been used, with variations on midline versus lateral entry into the spine as well as different means being used to maintain patency of the laminoplasty “door.” The classic method to maintain the door, as first described by Hirabayashi, was by means of suture anchors. Since then, various methods involving spacers or struts made of bone or synthetic material have been described. However, a more recent approach is the use of permanent metal plates to maintain patency of the canal. While this technique was originally described in 1996, and has since been the subject of several articles,,,, the study populations have generally been small. Here, we offer results from patients who underwent open-door laminoplasty procedures at the University of California of Los Angeles and Cedars-Sinai Medical Center, in an effort to further demonstrate the effectiveness and safety of plate utilization in laminoplasty procedures. The study was conducted through a retrospective, nonrandomized, uncontrolled review of all patients of two surgeons at the David Geffen School of Medicine during 2 years. Eighteen of the patients underwent laminoplasty procedures. Eighteen patients (11 with plate placement and 7 without) fulfilled the following strict criteria for inclusion in the study: (1) Had a carefully documented chief complaint (2) had documentation offering a clear characterization of the quality and severity of the chief complaint (3) had sufficient documented follow-up visits to fully characterize subjective and objective relief of myelopathy. Patient charts were comprehensively reviewed for information on initial symptoms, treatment, postoperational symptoms, satisfaction with treatment, and patient history factors. This was done by an independent third party. The data were then combined into a comprehensive database of patients. This database was then used to assess which patients had sufficient documentation to rigorously assess outcomes and to look for patient demographics, disease, and treatment factors that affected outcome. The outcomes for each patient were evaluated according to Odom's criteria [Table 1]. The Odom scores were then compared to treatment details in an attempt to discern the safety and effectiveness titanium plate usage in laminoplasty. The study involved all patients for which information was available that received laminoplasty procedures by two surgeons during 2 years. All patients had sufficient chart data to assess surgical outcome. The patients all underwent laminoplasty using the open-door technique. 61% (11 of 18) had Sofamor Danek or Synthes cervical laminoplasty plates installed. After exposure of the affected segments, a trough was made on one side through both cortices medial to the lateral mass at the lateral mass-lamina junction. On the contralateral side, a trough was then made, without going through the anterior cortex and slightly more lateral than on the right. The lamina was then hinged open, opening the laminoplasty door on the patient's right side. Foraminotomy was then done as necessary to alleviate nerve root compression. Fixation varied between three and five levels per patient. Ten millimeters allograft rib or fibula segments were notched and shaped for placement. These were then attached to the Sofamor-Danek cervical laminoplasty plates using a single 5 mm screw each. The combined allograft-plate grafts were then attached into the lamina and lateral mass with a minimum of three screws, with care taken to make sure that the grafts buttressed the laminoplasty door at each level. The fascia was then closed in the typical fashion. All of the patients were symptomatic at the time of surgery, with varying degrees of myelopathy including cervical, upper extremity, and lower extremity pain, weakness, or gait instability. The etiologies included degenerative disc disease, ossification of the posterior longitudinal ligament, and congenital stenosis. Eleven patients who underwent laminoplasty with plate placement were compared to seven who underwent laminoplasty without plate. There were 4 female and 14 male patients. The mean age was 68 years old (range, 42–82) for the plate group and 69 (range, 55–88) for the no-plate group [Table 2]. The median duration of symptoms before surgery was 24 months (range, 1–240 months) for the plate group and 9 months (range, 3–72) for the no-plate group. Decompression was generally from C3 to C7, with one case in the plate group from C3 to C6 and one from C4 to T1, as well as two patients in the no-plate group who were C3–C6 and one from C4 to T1 [Figure 1]. Foraminotomy was sometimes performed. There were no intraoperative complications with either procedure. Blood loss and hospital stay were similar for laminoplasty versus laminoplasty with the plate [Table 3]. Estimated blood loss was 160 cc with plate versus 150 cc without. Hospital stay was 4.8 days with plate versus 5 without. All 18 patients showed arrest and at least mild improvement of their myelopathy. There were similar improvements across all classes of presenting symptoms including upper and lower extremity pain, numbness, and weakness. All patients received an Odom score of at least “Fair” (Definite relief of some symptoms; other symptoms unchanged or slightly improved) while the majority of the patients received scores of “Excellent” (All preoperative symptoms relieved). Seventy-three percent of patients received scores of “Excellent” in the plate group versus 57% of the nonplate group. Ninety-one percent of patients received at least a score of “Good” in the plate group versus 71% in the nonplate group. Of note, no patients showed unchanged or worsened symptoms in either patient group [Table 4]. There were no complications during the operations using either procedure for all 18 patients. Postoperatively, two patients in the plate group complained of cervical pain lasting >2 months, and one in the no-plate group [Table 5] and [Table 6]. Despite laminoplasty's acceptance, there is still some debate about the usage of instrumentation. The usage of a titanium plate as presented here is not new; however, laminoplasty procedures are still done both with and without instrumentation. Conventionally, the laminoplasty door is propped open using struts of bone or synthetic material that are fixed into position with screws. Laminoplasty plates may be used as an adjunct to these bone spacers, providing rigid instrumentation to the strut and preventing door closure. This is particularly important in laminoplasty because decompression of the spinal cord in this technique requires continued elevation of the posterior spine. Failure of the door to remain open in the postoperative period would cause the lamina to fall back onto the cord, compressing it against the vertebral bodies and effectively recompressing it, causing recurrence of symptoms. The Sofamor-Danek titanium plates used in our patients may provide stability to the door as well as the spine itself. Closure of the laminoplasty door is a known complication, and long-term loss of anterior-posterior diameter is thought to be one of the principal causes of renewed myelopathic symptoms. Here, we present the results of eighteen patients treated with laminoplasty with and without the usage of titanium plates. The two populations were evenly matched. The mean ages, as well as the age ranges, are similar, allowing direct comparison between the groups. Both upper and lower extremity myelopathic syndromes, including weakness, pain, numbness, and gait disturbances, are reflected in both groups. All procedures were done by the same two surgeons, working in pairs, with each pair of surgeons performing laminoplasty both with plate and without. To avoid potential bias, the charts were reviewed by an independent party. The surgical outcomes of the laminoplasty with plate and laminoplasty without plate groups demonstrate the effectiveness of plates in laminoplasty procedures. Similar fractions of patients had Excellent or Excellent/Good in each of the two groups, though there was no statistically significant difference between the two groups (P = 0.672 and 0.582, respectively). Plate utilization in laminoplasty provided at least partial relief of myelopathic symptoms in 100% of patients, with minimal persistence of preoperative symptoms in over 90%. Furthermore, there was no evidence of new myelopathic symptoms in any patients during the follow-up period, except for one patient who experienced a relapse of symptoms following a fall. Hospital stay and blood loss were similar in the two procedures, suggesting that the addition of instrumentation did not complicate the surgery. There were zero surgical complications in any of the 46 patients whose charts were reviewed. It was somewhat disappointing that a significant fraction of the patients who underwent laminoplasty procedures had insufficient follow-up to rigorously assess outcomes. This happened for a variety of reasons, the chief being a lack of follow-up. Other reasons included unclear chart documentation of alleviation of symptoms. All patients for whom it was felt outcome could be fully assessed were included in the study. However, it was felt that accurate determination of outcome was more important than sample size. A concern might be that patients that were ultimately not included in the study had significantly different outcomes than those that remained. However, inclusion was determined before assigning clinical outcome. For the purpose of this retrospective chart review, clear documentation of postoperative symptoms was required for study inclusion. Further data might have been obtained by arranging follow-up visits with the patients for the purposes of this study. This is a consideration for further research. Odom scores were used in this study, despite the apparent subjectivity of the scoring. This was done for several reasons. Foremost, the relatively uncommon nature of this procedure would not lend itself to statistical analysis of more rigorous outcome measures. Furthermore, while not quantitative, we feel that the Odom scores are a good measure of patient satisfaction with the procedure. Strict criteria were used in determining “Excellent” outcomes, with neither patient history nor physical examination findings showing residual disease. Limitations inherent to this study include a relatively small number of patients and lack of long term follow-up. We hope that the high standards for inclusion help to compensate for the former. Further studies involving larger number of patients may help to demonstrate a clear advantage to the use of plates in laminoplasty procedures, while also providing important data on the long-term effectiveness of plate utilization. Laminoplasty with plate utilization is an effective treatment for cervical myelopathy. Although the number of patients involved in this study was limited, the similarity in outcomes and complications between these two similar cohorts suggest that laminoplasty with plates is an attractive alternative to more traditional methods. We hope that future efforts will continue to demonstrate the effectiveness and perhaps superiority of plate utilization in laminoplasty. Hirabayashi K, Watanabe K, Wakano K, Suzuki N, Satomi K, Ishii Y, et al. Expansive open-door laminoplasty for cervical spinal stenotic myelopathy. Spine (Phila Pa 1976) 1983;8:693-9. Heller JG, Edwards CC 2nd, Murakami H, Rodts GE. Laminoplasty versus laminectomy and fusion for multilevel cervical myelopathy: An independent matched cohort analysis. Spine (Phila Pa 1976) 2001;26:1330-6. Seichi A, Takeshita K, Ohishi I, Kawaguchi H, Akune T, Anamizu Y, et al. Long-term results of double-door laminoplasty for cervical stenotic myelopathy. Spine (Phila Pa 1976) 2001;26:479-87. Sani S, Ratliff JK, Cooper PR. A critical review of cervical laminoplasty. Neurosurg Q 2004;14:5-16. Wang MY, Shah S, Green BA. Clinical outcomes following cervical laminoplasty for 204 patients with cervical spondylotic myelopathy. Surg Neurol 2004;62:487-92. Sakaura H, Hosono N, Mukai Y, Ishii T, Iwasaki M, Yoshikawa H, et al. Long-term outcome of laminoplasty for cervical myelopathy due to disc herniation: A comparative study of laminoplasty and anterior spinal fusion. Spine (Phila Pa 1976) 2005;30:756-9. O'Brien MF, Peterson D, Casey AT, Crockard HA. A novel technique for laminoplasty augmentation of spinal canal area using titanium miniplate stabilization. A computerized morphometric analysis. Spine (Phila Pa 1976) 1996;21:474-83. Deutsch H, Mummaneni PV, Rodts GE, Haid RW. Posterior cervical laminoplasty using a new plating system: Technical note. J Spinal Disord Tech 2004;17:317-20. Park AE, Heller JG. Cervical laminoplasty: Use of a novel titanium plate to maintain canal expansion – Surgical technique. J Spinal Disord Tech 2004;17:265-71. Matsumoto M, Chiba K, Toyama Y. Surgical treatment of ossification of the posterior longitudinal ligament and its outcomes: Posterior surgery by laminoplasty. Spine (Phila Pa 1976) 2012;37:E303-8. Sakai K, Okawa A, Takahashi M, Arai Y, Kawabata S, Enomoto M, et al. Five-year follow-up evaluation of surgical treatment for cervical myelopathy caused by ossification of the posterior longitudinal ligament: A prospective comparative study of anterior decompression and fusion with floating method versus laminoplasty. Spine (Phila Pa 1976) 2012;37:367-76. Baisden J, Voo LM, Cusick JF, Pintar FA, Yoganandan N. Evaluation of cervical laminectomy and laminoplasty. A longitudinal study in the goat model. Spine (Phila Pa 1976) 1999;24:1283-8. Baba H, Maezawa Y, Furusawa N, Imura S, Tomita K. Flexibility and alignment of the cervical spine after laminoplasty for spondylotic myelopathy. A radiographic study. Int Orthop 1995;19:116-21. Puttlitz CM, Deviren V, Smith JA, Kleinstueck FS, Tran QN, Thurlow RW, et al. Biomechanics of cervical laminoplasty: Kinetic studies comparing different surgical techniques, temporal effects and the degree of level involvement. Eur Spine J 2004;13:213-21. Edwards CC 2nd, Heller JG, Murakami H. Corpectomy versus laminoplasty for multilevel cervical myelopathy: An independent matched-cohort analysis. Spine (Phila Pa 1976) 2002;27:1168-75. Ratliff JK, Cooper PR. Cervical laminoplasty: A critical review. J Neurosurg 2003;98:230-8. Satomi K, Nishu Y, Kohno T, Hirabayashi K. Long-term follow-up studies of open-door expansive laminoplasty for cervical stenotic myelopathy. Spine (Phila Pa 1976) 1994;19:507-10.